Guns, ammunition, bootlegged liquor, illegal drugs, counterfeit cash—these are the most common objects that generations of smugglers have carried across the US-Mexico border. Historians of the borderlands, as well as residents of the area, know that government agents on both sides of the line have never been able to gain complete control over this type of trafficking, despite their best efforts. And so, from the late nineteenth century to the present day, the borderlands have been portrayed in popular culture as a site of sin and dissolution, contraband and illicit trade. During the 1920s and 1930s, however, Mexican and American citizens began smuggling an entirely different type of contraband across the frontier. This was religious paraphernalia—scapulars, rosaries, images, and printed materials—largely created in the United States by Catholics from both countries and intended for distribution within Mexico. Among the people who trafficked this material were young Mexican migrants, priests and nuns, members of the Knights of Columbus, and many other otherwise law-abiding citizens. At the same time, large numbers of Mexican citizens began sneaking across the line—not to gain permanent entry to the United States, but simply to attend Catholic Mass, which they could not do at home. At the root of this clandestine Catholic activity was the Cristero War, a bloody conflict between Catholic militants and the Mexican government that began in 1926 and would not come to an end completely until the late 1930s. The war had begun when Catholic loyalists—called cristeros for their battle cry of ¡Viva Cristo Rey! or “Long live Christ the King!”—took up arms in order to resist a set of anticlerical reforms enacted by the government of Plutarco Elías Calles and his handpicked successors. During its most violent phase, from 1927-1929, the conflict ravaged the Mexican heartland and claimed the lives of an estimated one hundred thousand people. Although the war would formally end in 1929, when Church and state leaders forged a series of compromises known as the arreglos, Cristero militants would continue to launch sporadic uprisings until the late 1930s, when the Mexican government stopped enforcing many of the anticlerical laws. 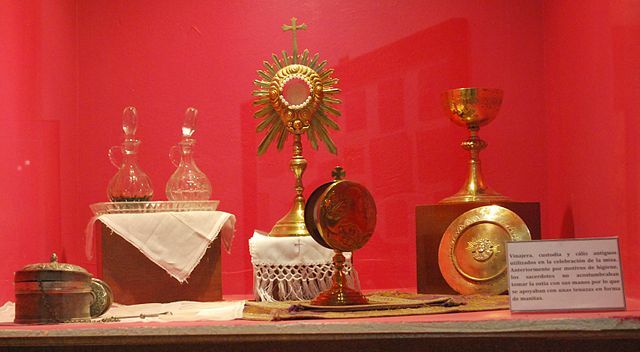 “Catholic liturgy items used clandestinely during the Cristero War” by AlejandroLinaresGarcia. CC BY-SA 3.0 via Wikimedia Commons. Although the war was fought most intensely in the west-central Mexican heartland (including the states of Jalisco, Guanajuato, and Michoacán), the border region was also strongly affected by the religious conflict. There were several reasons for this. First, by the early 1920s, those three west-central states had become the top states sending Mexican migrants to the United States, and so thousands of labor emigrants were arriving in Texas, southern California, and other border states with experience and knowledge of the religious conflict. Second, after the outbreak of the Cristero War, the Mexican government began deporting Catholic clergy (at least 2,500 priests, nuns, and members of religious orders arrived in the United States during the late 1920s). These religious refugees typically resettled in urban areas where there were large and growing Mexican communities, such as Los Angeles, El Paso, and San Antonio. Finally, these religious refugees were joined by lay Catholic political exiles from Mexico. The conditions of migration during the late 1920s helped to create a diaspora of Mexican Cristero supporters in the United States. This network spanned the borderlands and eventually even extended into the growing Mexican communities of the Midwest. During the 1920s and 1930s, these Catholic partisans organized clubs and associations, sponsored religious processions and other public activities within their neighborhoods, and lobbied politicians on both sides of the border in support of their cause. Many of them also participated in clandestine efforts to help the Cristero efforts from abroad, including raising money, recruiting soldiers from among the young migrant population, and printing leaflets and religious tracts to be sent back to Mexico. A few of them even organized armed religious revolts along the border, and others contributed money for guns and ammunition that could be sent to the Cristero troops on the battlefields in the Mexican heartland. In participating in these religiously motivated smuggling efforts, the Cristero diaspora found some support from their American Catholic counterparts. In the United States, the loudest voice came from the Knights of Columbus, a Catholic fraternal organization whose leadership launched a fundraising campaign, the Million Dollar Fund, which produced pamphlets in English and Spanish denouncing the anticlerical Mexican government and publicizing the effect of the Cristero War on Mexico’s Catholics. This printed material, along with the literature produced by Mexicans in the United States, was passed so frequently into Mexico during the war years that the Mexican government issued specific warnings about the problem, including a directive for border guards to be on the lookout for nuns and other Catholic women, who were known to bring Catholic propaganda into the country underneath their dresses. Thus, during the 1920s and 1930s, smuggling along the border took on a distinctly religious character, as Cristero emigrants, exiles, and refugees attempted to support the Catholic cause from across the border. The story of Mexican emigration during the Cristero War adds an additional dimension to common perceptions of the borderlands as a site of clandestine vice and misbehavior. The Cristero partisans of the 1920s and 1930s may have been breaking laws by trafficking in outlawed materials, but they did so not for economic gain, but in order to participate in a cause that they believed was good, moral, and holy. As scholars increasingly turn their attention to the transnational dimensions of religious conflicts, we will surely see other cases—historical and contemporary—where border regions became sites of intense religious activity. Image Credit: “Priests returning from Los Angeles to Mexico, July 5, 1929.” Author’s collection. Julia G. Young is Assistant Professor in the Department of History at The Catholic University of America. 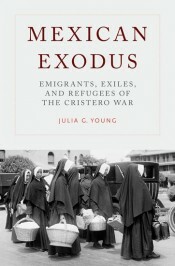 She is the author of Mexican Exodus: Emigrants, Exiles, and Refugees of the Cristero War.